Fly-half Billy Burns says he is "ambitious" to play for Ireland but is focusing on performing well for Ulster. The 24-year-old former Gloucester number 10 has joined the Irish province on a two-year deal and qualifies for Ireland through a paternal grandparent. Burns made his competitive debut for Ulster in the 15-13 win over Scarlets. "You ask any player and the ambition is there to play at international level. First and foremost though I signed to play well for Ulster," said Burns. "I'm hugely ambitious and hopefully I can help Ulster push for trophies both in Europe and in the Pro14. "The main thing for me is to play well week in, week out and see what comes off the back of that. I have some good competition in the form of Johnny McPhillips and Michael Lowry so I know I have to prove my worth." Burns linked up with new half-back partner John Cooney for the first time in Saturday's victory over last year's Pro14 runners-up at Kingspan Stadium and admits the partnership will be a work in progress. "In any successful team they have a combination at nine and 10 that know how each other work and for me it was a case of starting to learn what makes him tick - what he likes in his fly-half and him learning about me as well. "I could tell after the first 10 minutes that he's a really class operator but every player is slightly different. "The same goes for Stuart McCloskey outside me. I hadn't played with him before but we did plenty of good stuff and there's still lots more to come from us. "The more we play together those combinations can only improve. It's hugely exciting." The former England Under-20 and Under-18 international made his senior debut for Gloucester in 2012 and scored 304 points in 101 appearances for the Premiership outfit before moving to Ulster, but says he is adjusting well to life in the province. "I've been made to feel very welcome. There are a great group of young lads here who are hungry to push forward and are ambitious - that was part of the reason that made me want to sign over here. "My girlfriend is also over here now and is settling in well - she enjoyed going to Kingspan to watch the game the other day and all is going to plan so far. "It's a huge change but probably more for those around you than yourself. "It's pretty easy for me because I'm coming straight into an environment with people who are all driven by the same thing as you are and that is to be successful and have a passion for rugby. "When you are bringing over family it's always tough for them but credit to the club - they have been awesome. My family came over to watch my first game and they looked after them really well." 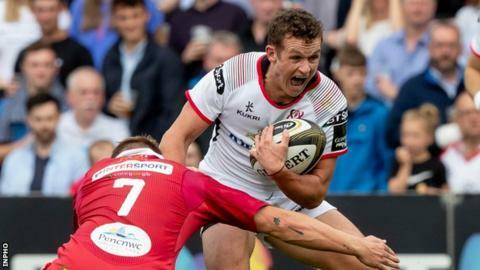 On Friday night Ulster face an Edinburgh side who were part of the Pro14 play-offs last season but began the new campaign with a 17-13 defeat to Ospreys last weekend. The Scottish side ran out 17-16 winners on their last visit to Belfast for a Pro14 Conference B fixture in February. "It's going to be a massive challenge. They are a well coached side with Richard Cockerill at the helm and they are a team that pride themselves on their physicality and doing their basics well so we are expecting a real physical battle. "We know we have to improve our performance from the weekend and while we can take a lot of positives from Saturday we know we have to be a lot better going forward. We're excited by the challenge."